Take two young and highly gifted people with polar opposite creative processes, and what do you get? A mind meld that produces a one-of-a-kind Art Bra. While Lily Parish draws inspiration from emotion — sometimes a single idea, moment, facial expression or phrase inspires an entire screenplay, poem or painting — Walker Winn’s style comes from finding beauty in order and calculation. And while Lily, an artist, storyteller and “professional space cadet” and Walker, a soon-to-be-graduated pharmacy student, have no personal connection to BCRC or even breast cancer, they were understand the gravity of the disease and are eager to create and collaborate in order to give back to their community. It’s through this kind of youthful passion and unleashed creativity, combined with a commitment to women’s health and community service, that Art Bra Austin continues to flourish. 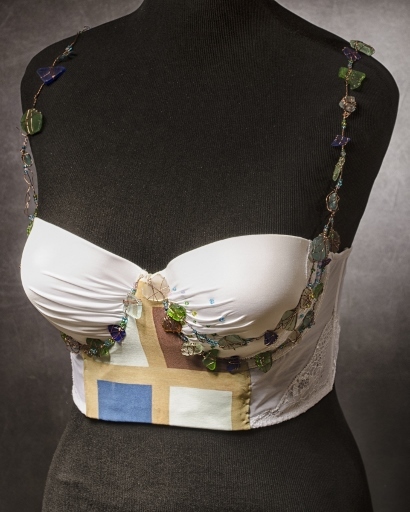 Using sea glass, copper wire, glass beads, fabric, Lily and Walker utilized the “divide and conquer” technique to pull off this piece of wearable art. Walker first painted the piece, matching the colors of his squares to the sea glass he has once collected as a child during family trips to the beach. A detail image from the original painting can be viewed below. You’ll see the painting’s color-drenched squares that reflect Winn’s signature style; his use of resin with oil strengthens the impact of each piece with enhanced color intensity and extreme sheen.